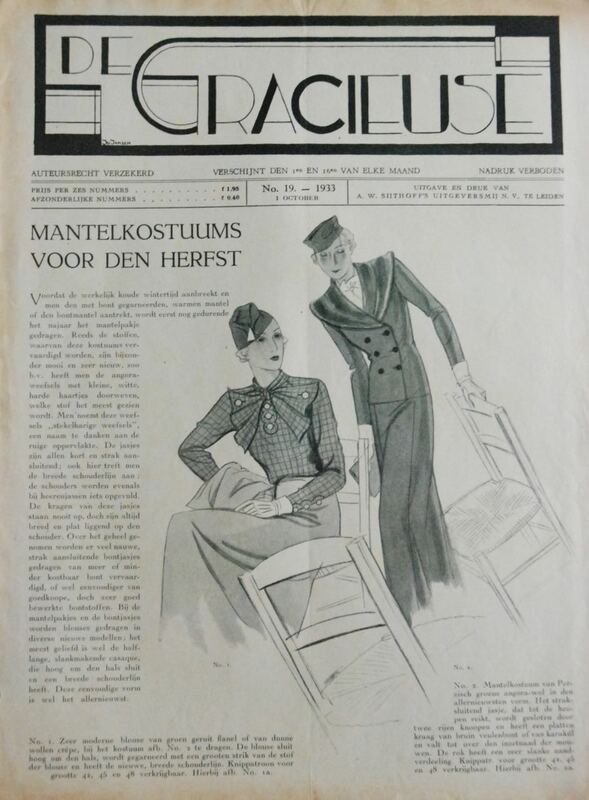 That is the title on this issue of Gracieuse magazine. It's magazine nr. 19 from 1933, to be precise (it was published twice a month). I has been ages since I last showed you any vintage pattern magazine goodness here so I thought it was high time. 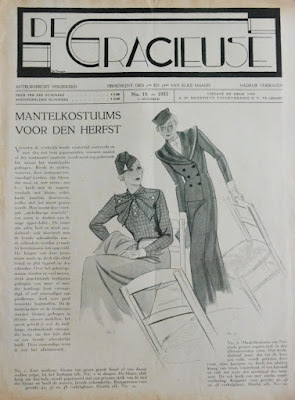 The first page always has a short article about the current trends in fashion. This one is about the new suits for autumn. The outfits in the drawing are the magazine's own designs though, and the reader could order the patterns for them. Then, we get "new elegant dresses for tea and cinema visits". Such an interesting concept. I wouldn't have guessed that those activities would call for the same kind of outfit. Maybe it is just because both are informal public outings. 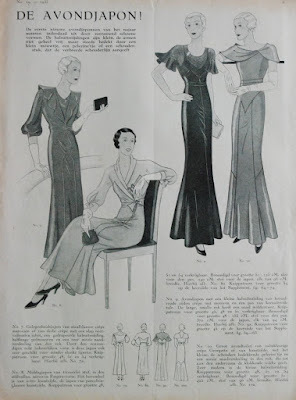 The next page is dedicated to "the evening gown". 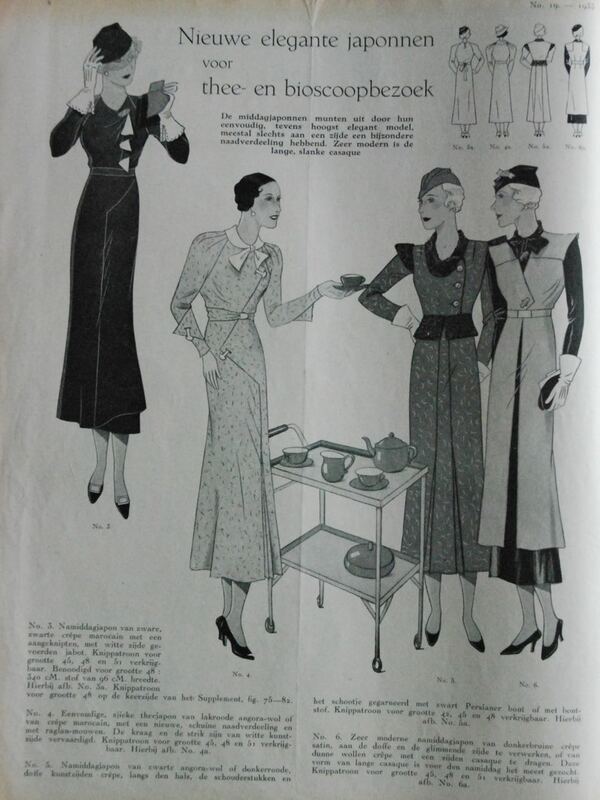 The second one from the right, the black dress, is the design I sewed up (with lots of trouble) earlier this year. 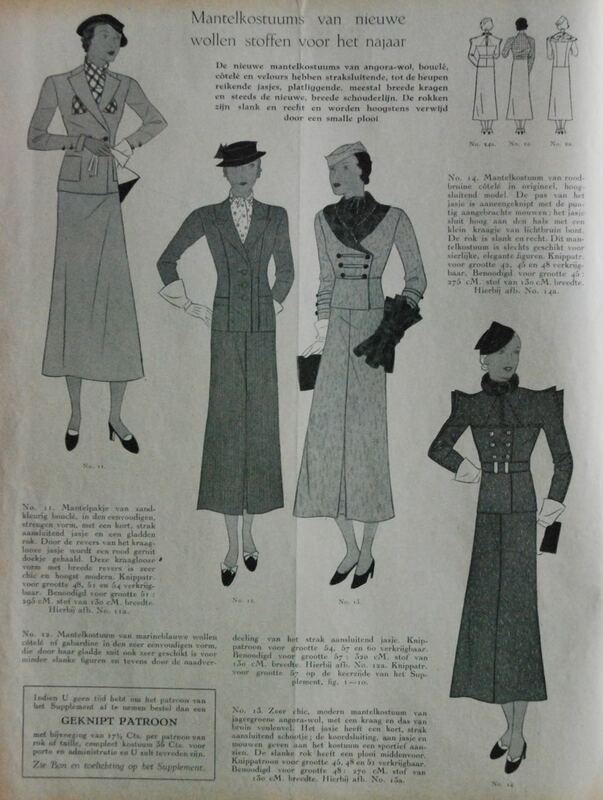 "Suits from new wool fabrics for autumn"
"Simple wool dresses with wide shoulder decorations". These are 1930's silhouettes the way we all recognize them! 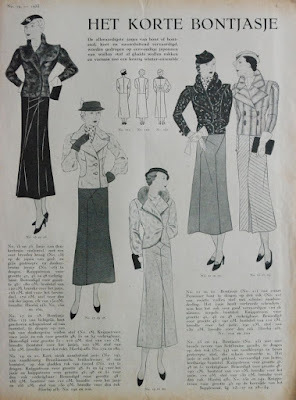 The last page with sewing patterns always has a lot of back views and some simplified versions of the designs which have already been shown. The pattern is easy to make based on a tried-and-tested t-shirt pattern and it's easy to sew as well. Easier that a proper cowl-neck even. 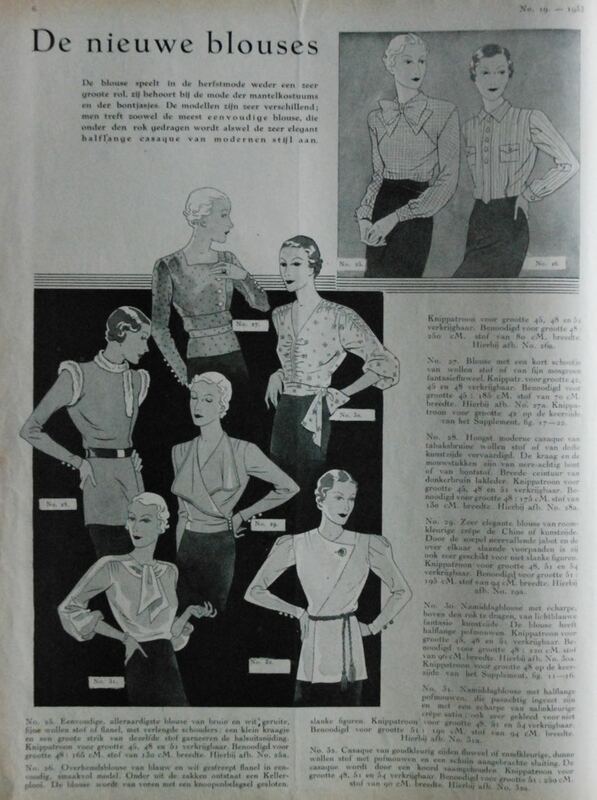 You start out, obviously, with the bodice pieces of your pattern. If your t-shirt block has bust darts, it can be easy in this case to rotate them to center front. Draw in the new neckline. 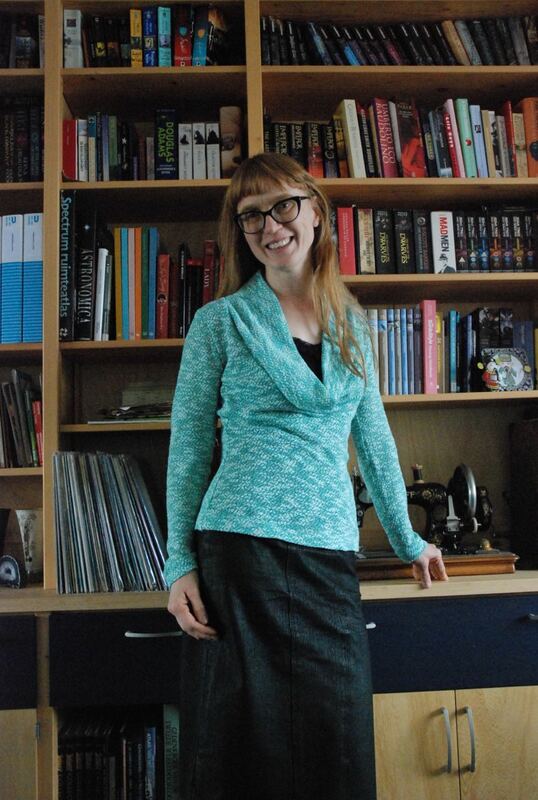 I made it about 2 cm wider at the neck (starting from a high, close fitting neckline) and made a long, narrow deep scoop to about 10 cm above the waistline. This goes through the bust point and should include any bust darts there may have been. 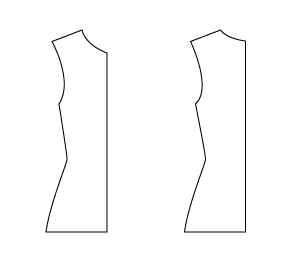 Draw a new back neckline to match the front one at the shoulder seam. Only lower its point at the center back line as much as you need to make a nice curve (no more than about 0.5 to 1 cm). Measure your new neckline and use the measurement to draft the drape piece. It's easiest to just draw a horizontal line first, in the middle of the paper, of the length you measured. Then, draw the center front and center back lines at 90 degrees from that line (only draw one side). Mine are 24 and 8 cm respectively. 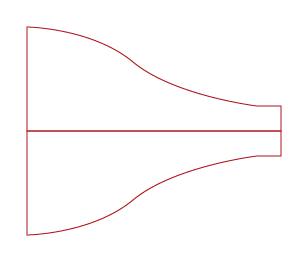 Draw a gentle curve between them as shown. 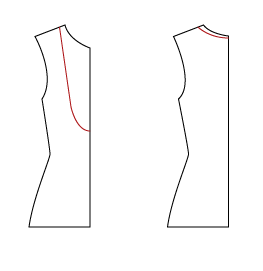 Now, measure along the curve and adjust the beginning and end of the piece so the curved line has the length required for the neckline of your top. Add seam allowance if you like, fold the paper along the horizontal line and cut the drape piece out through both layers. You should end up with a pattern piece which looks like the one in my drawing. When cutting fabric, both the bodice pieces and the center front of the drape piece should be cut on the fold. When sewing, start with the shoulder seams of the bodice pieces and the center back of the drape piece. Then, fold the drape piece double with the wrong sides facing each other and insert it into the neckline, treating it as one layer. Because the result drape neckline is smaller than the seam line, the stitching won't easily be exposed. 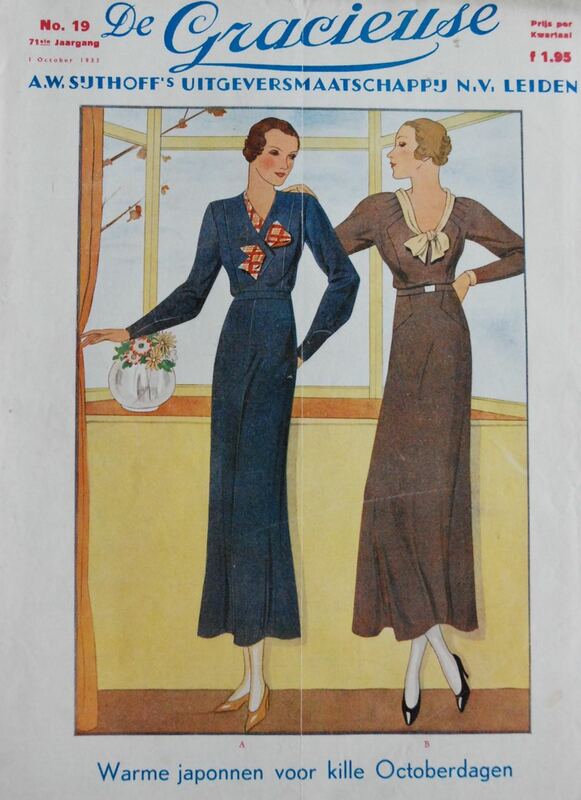 Of course, you can make lots of variations by changing the size and placement of that draped neckline. Or you could put the fullest part of the drape somewhere else than at center front. Or you could also insert a piece like a dickey into the neckline, keeping the top even more fitted and eliminating the need to wear something under it. I hope you like this tutorial and everything is clear. Don't hesitate to ask questions, just make sure I can reach you to give an answer (if your blog or email address in your profile or comment, I'll use that. If it isn't, I can only answer here in the comments so make sure you check. Or email me instead, the address is at the top right of this page) And as usual, I'd love to see your results! Thank you for your replies to my previous post! 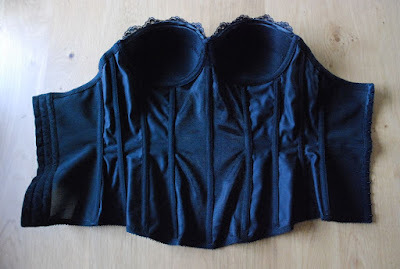 If you are trying to sew an item like a lingerie corset/merry widow or some other piece of shapewear, I would recommend finding a specialized (web)shop and explaining what you need. They should be able to help you make a selection from what they sell. This week, I have just been making some simple things. The sort of basic tops you always end up needing. At least, I always do somehow. The shoulder seams on my t-shirts always pulled towards the back a little, so I'm not even sure it is worse now. I think I'll just wear these for a while and then decide, based on that experience. 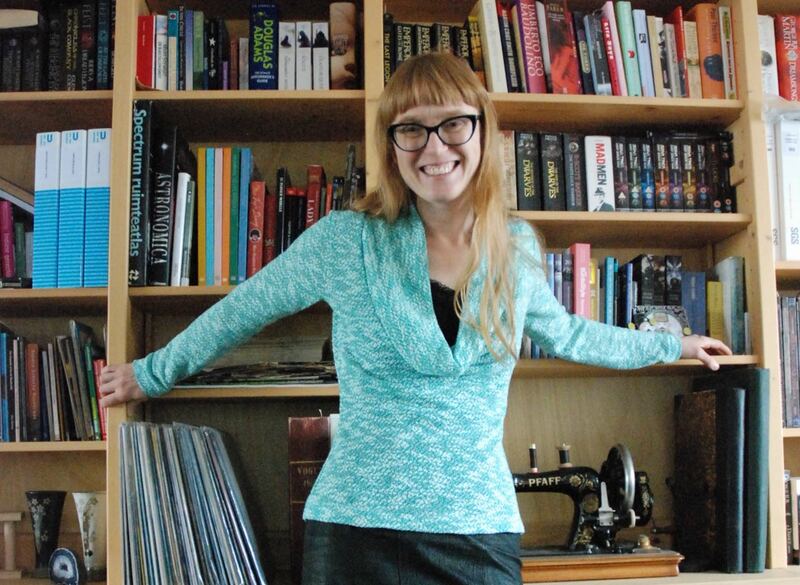 Anyway, this white and green knit is a bit thin and transparent but nice (and not made from polyester because there is no static cling!). 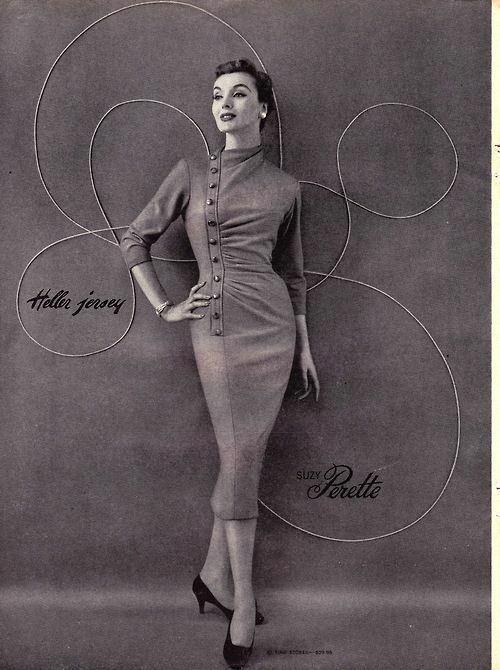 Because I would always have to wear something under it anyway, I gave it a nice, deep, draped neckline. It is not a cowl neck, just a deep scoop with a drape piece sewn on to it (I'll make a little pattern how-to tomorrow). The other top is even simpler. Just a long sleeved t-shirt. I've been holding on to this striped fabric for two years now. It's lovely and soft and it cost a little more than I usually pay for jersey. For most of the time, I was saving it for some special project even though it was obviously perfect for a basic top like this. So, that's what I did with half of the fabric after all. The top may look very simple but it took me more time to make than the green one. All because of the material. 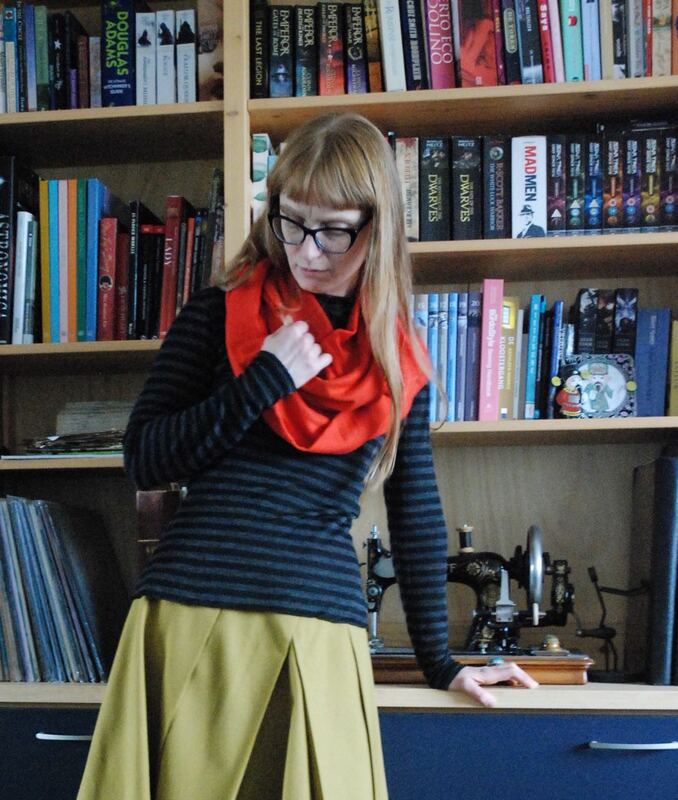 I tried to cut the pieces carefully, so I could match the stripes but the fabric is very soft and shifty. It is also made of two layers: The transparent, striped outer layer and a black inner layer. Both are very soft and thin and they are tacked together at about 3 cm intervals. Where the fabric is cut, the layers start to peel apart. 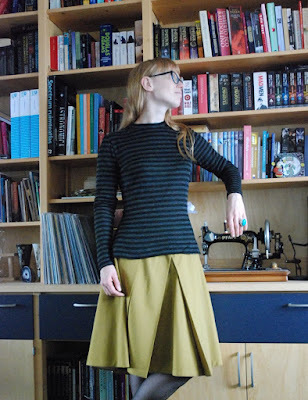 I managed to sew it up, matching the stripes at the side seams and along the sleeves, only to find out that the fit was too loose and baggy (that's what you get when using such a soft, slinky fabric). I took it in but the stripe matching is less good now. I kept the sleeves on both tops a bit long. It felt nice and bigger arm- and shoulder muscles make sleeve pull up so it may work as a long-term plan (or not, because their fit is still pretty slim). 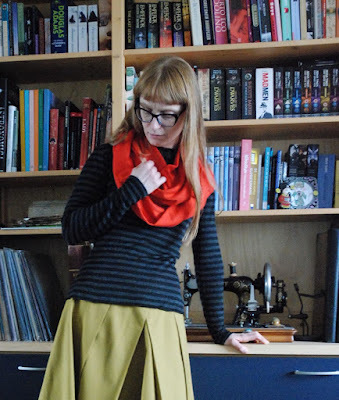 And I made something even more basic: A loop-scarf. This red jersey is made from nice cotton, knitted in the round. Cotton and nothing else. As a result, it has no recovery whatsoever. I made a top from it once. After one day of wearing, I had to take in about 5 cm at each seam. And it still kept "growing" and didn't keep its shape. And washing didn't restore it either. I still had a meter and a half of the stuff and when I was picking out fabric for the tops, I found it and realized it would work as a scarf. That way, I don't have to worry about fit no matter how much it stretches out. So, that's what I did. I also have some off-white and some black jersey in my stash which have the same annoying qualities (all of it was very cheap. On sale for only 1 euro a meter...). I may just give those fabrics the same treatment. I haven't been sewing or blogging quite as much as usual lately. Partly, that happened just because I've been busy with other things but there is another reason too. I'm second-guessing some of the plans I announced earlier. Obviously, there turned out to be other wardrobe needs than just pretty vintage style dresses, but that is always to be expected. 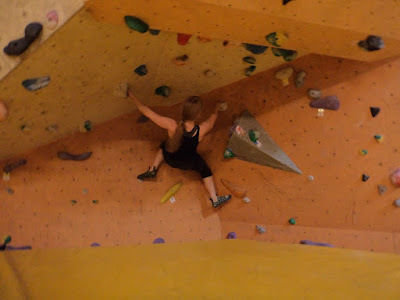 The real issue which slows me down at the moment is this: I have been rock climbing occasionally for a few years but since about April of this year, I'm more serious about it. As in: I'm at the climbing hall two or three times each week. For climbing or bouldering. I'm really enjoying it and I am getting better. I hope to learn lead climbing in spring. However, all this sporting activity is not without effect. It was not a problem that the few pairs of trousers which had become too tight last year now fit again... But there are also some t-shirts on which the shoulder seam looks a bit short now and some other clothes feel a bit tight across the back. 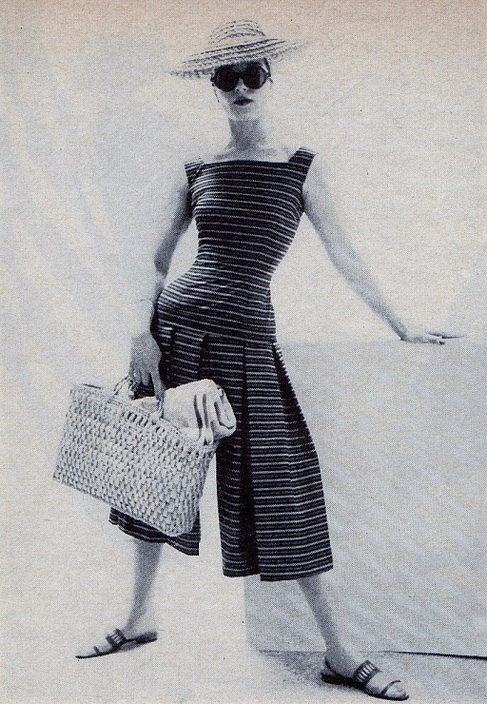 Fortunately, all my favorite dresses still fit. For how long is the question. It is to be expected that more climbing will give me stronger muscles in general and in my arms and shoulders in particular. Of course I can make new slopers to fit the new, more sporty, me but it seems too early to do that. And then there is the matter of style. Over the past years, I have pretty much perfected a look which suits my proportions (at least, I think so) but new muscles could make a real change there. Will my signature blend of 1950's and contemporary fashion still work then? My own corset belt from that free pattern from corsettraining.net. I only finished it today. If I had just used normal fabric and followed the instructions, it could have been done a lot quicker. This corset pattern is made up from only two pattern pieces. That's a very low number for a corset so I didn't completely trust it at first. And I know I have a rather large "hip spring" (difference between waist and hip) naturally so I would never assume a standard pattern, even one for such a short corset, would just work for me. 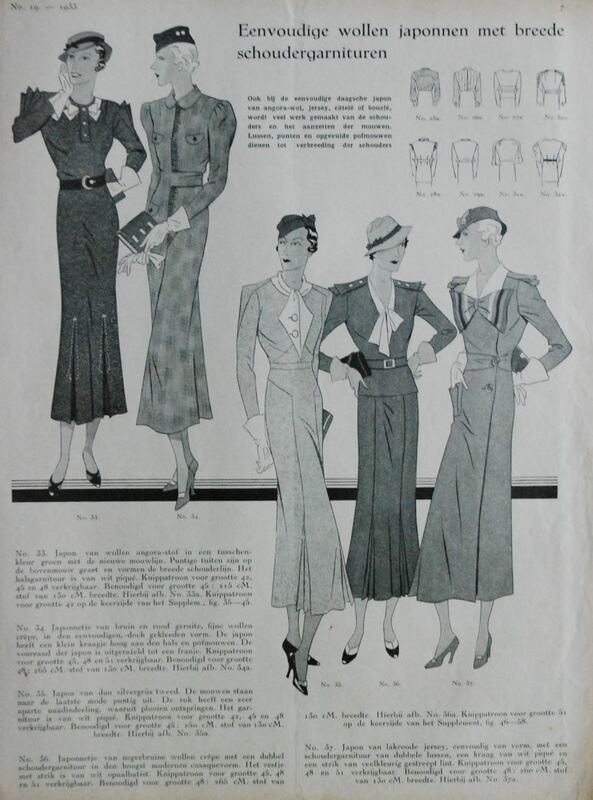 The pattern comes in a whole range of sizes based on waist measurement. For those who are between sizes, the recommendation is to either cut the pattern between sizes or "pick the smallest for a more dramatic waistline". I don't really agree with that last statement. 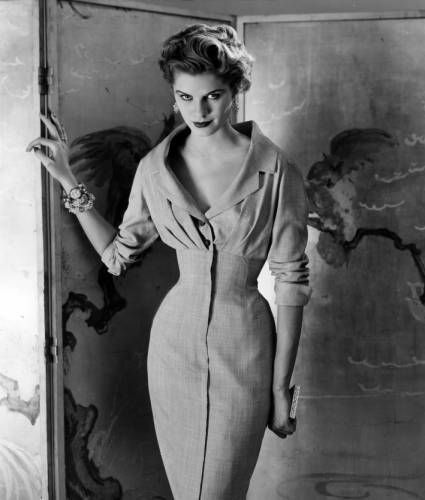 A corset, even such a small one, is more than just that tight waistline. It won't fit well if it cuts at hips and ribcage. Of course, you could alway lace it a bit looser than it is supposed to be (Scarlett's recommends to wear these with a 2 inch gap at center back). I made a muslin to test the pattern in relation to my body and compared it to that black satin RTW underbust corset I showed in the previous post. Based on that, I went with a waist size 10 (I'm between sizes, this was the closest one, and 1 cm down from my measurement) and a size 12 at the top and bottom edge. This corset was a small enough project to finally use it. I even managed to make the binding from the leather. And all the boning and the fabric for the lining were from my stash too. The only things I had to buy were grommets and ribbon. I didn't just do things differently because I'm stubborn and like to do things my own way. Working with leather meant I had to deal with the different qualities of the material. Like the thickness of the material and the fact that you can't press it. 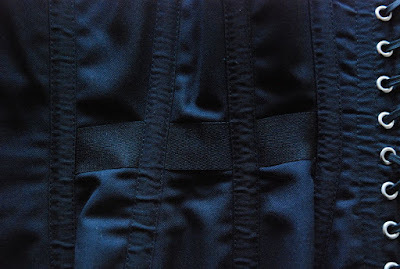 After sewing the seams of the panels, I topstitched the seam allowances on one side of each seam. On the fabric lining, I stitched them all to the other side, then I matched up the seam lines and stitched through all the layers, once at the seam and once at 8 mm from it (on the side where there was just a single layer of leather but three layers of fabric), creating boning channels. Oh, and there is waist tape in in the side panels. In the front and back pieces, the boning channels are just made by rows of parallel stitching. There are flat steel bones at either side of the grommets at the back and 5 mm wide spiral steel ones everywhere else. 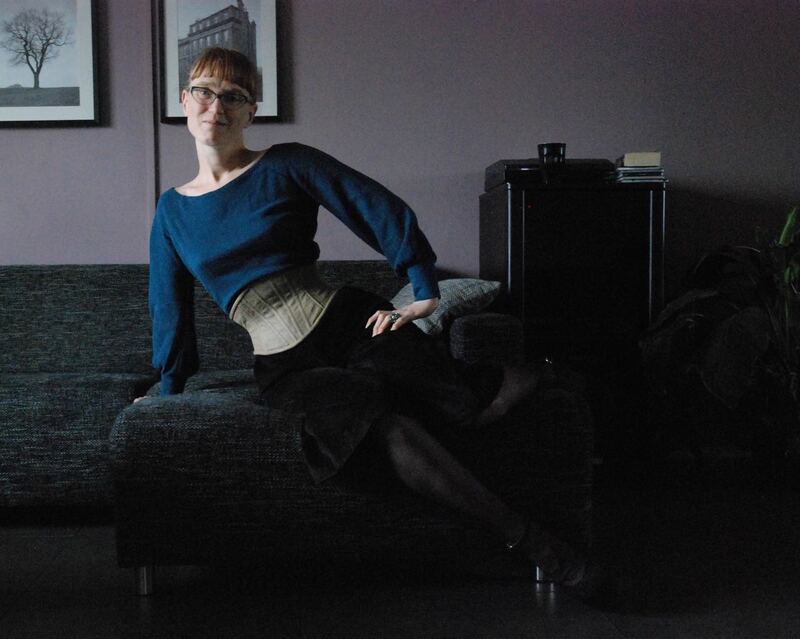 This corset isn't designed with a busk or any other means of front closure. It gives it a nice smooth line but putting it on and taking it off is a bit of a struggle. On the other hand, it is quite comfortable so it is not really a problem to keep it on for a while. The comfort of it has a lot to do with that super-short shape. Usually, the main thing with wearing a corset, even more so than pressure at the waist, is the way it changes your posture and freedom of movement. The longer the corset, the more restricted you are. Standing and walking in a corset is usually not a problem. Sitting can be a different matter, especially if you try sitting on normally comfortable low, deep seats. You just can't slouch in a corset. I can't slough in this one either but it does allow for a greater range of movement than any other corset I have ever worn. I've decided to get started on the corset belt. I found some spiral steel boning I had left over from a corset for a friend years ago. It's easily enough for this little thing. I want to make the corset belt from leather. The outside that is. 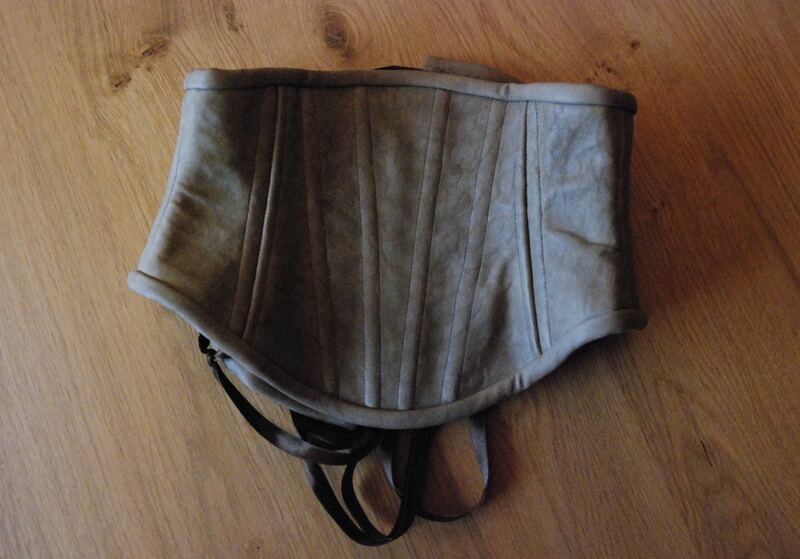 By its very nature, leather is strong but a bit stretchy so for a corset, a sturdy support layer is needed. 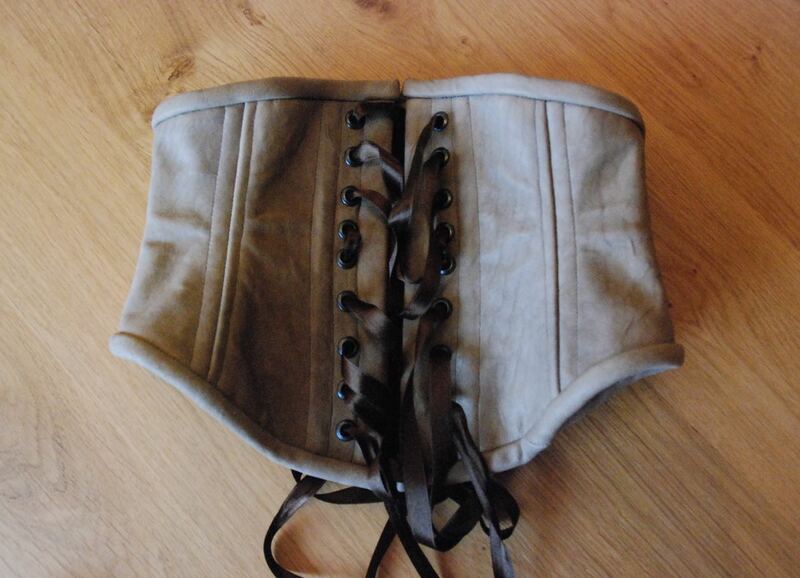 I will use the same strong but fairly thin twin which I used for my lingerie corset. It's the details I'm considering now. Most specifically the placement of the boning. The corset belt pattern comes with three different suggestions for bone placement, each building on the other. It doesn't come with specific instructions on how to apply the boning (that information is probably on Scarlett's site, I have to confess I didn't check) but I know about three different options. Most patterns, especially the easy ones, tell you to sew boning channels to the wrong side of the corset. You can buy these ready-made or just sew on tape of an appropriate width. It isn't difficult and it will give you a corset with a smooth outside. The downside is that, especially if you wear the corset tight, the bones may dig into your skin. 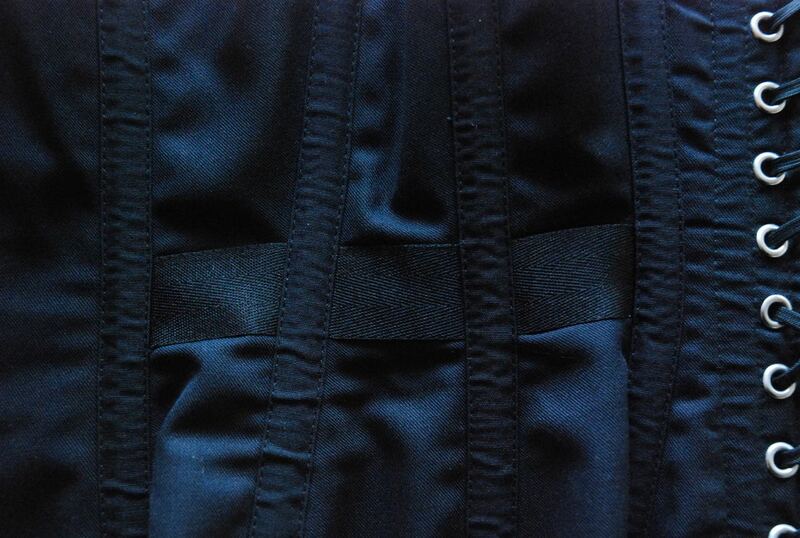 Another option is to apply boning channels to the outside of the corset. All the pretty RTW corsets with contrasting boning channels are made that way. Of course, that means you will have to stitch them very carefully and pick a material which will look good. The bones won't dig into your skin but they will stick out from the surface of the corset. That is fine if you are wearing it as outerwear but not so great when the corset is supposed to function as an undergarment. The third possibility is a bit different. For this one, you need the inside and outside of the corset to be separate layers. You sew them together at the center front and center back first and then create boning channels by stitching the two layers together. It requires very careful matching of the seams of both layers but it will provide you with a beautifully smooth corset. 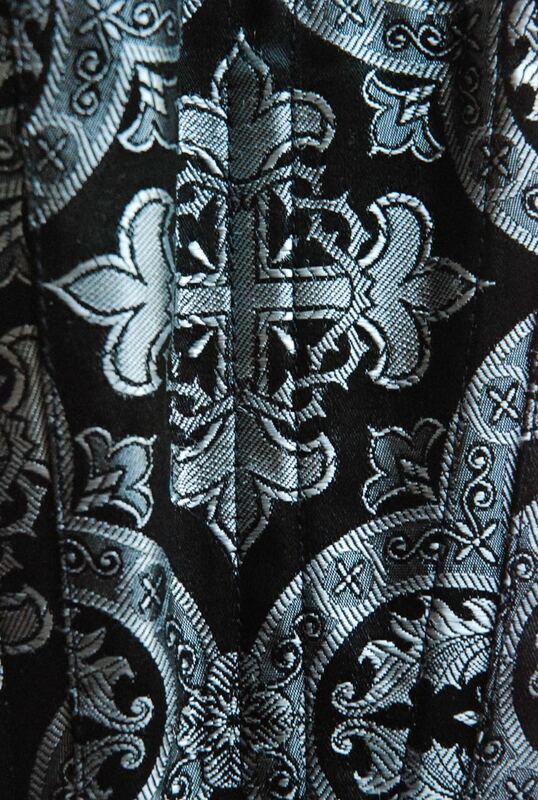 In a lot of corset patterns, all or many of the bones are placed at the seams. In method one and two, the boning channels are placed on top of flat-felled seams. With method three, they are place next to the seams. Of course, it is possible to sew the boning channels in different positions but all the stitching lines go through the corset so you have to consider but look and strength. I thought about using boning channels on the outside first but now I tend towards the third option. The corsets in the pictures are both RTW. For the black-and-silver one, method three was used, for the black one method one. The corsets are very different in style and shape so they don't allow for a direct comparison between techniques. I'm going to cut out the pieces now. It's time to make a corset. Like so often happens, making lingerie and making shape wear made me think about making more lingerie and more shape wear. And I feel like trying some new things. 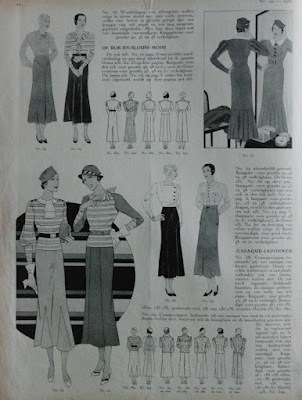 I am planning to try and make a power net waist cincher and a longline girdle but I am a bit sort on time lately, so it those may not be my first priorities. So, it was nice to come across some options on other blogs. Options which are very different to what I would come up with myself. First (and something I would think of myself) I read Emerald Erin's blog and she was making corsets. And the website where she bought her patterns offered a free download for a corset belt (link goes to the page with all the patterns, scroll down to find the corset belt). Basically this is just a very short underbust corset. 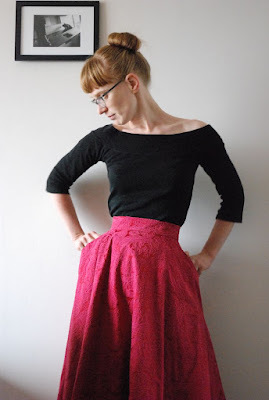 An easy to wear (for a corset) option that might just look great over clothes with a bit of a 1950's flair. Or just over a t-shirt. I want to make a muslin this week but I will have to wait with the real version until I have ordered new spiral steel boning. I plan on making it from suede or leather. Then, I read Carolyn's blog and she had been trying out a very interesting new bra pattern. Also a free download. This unusual style is, obviously, meant for small bust sizes only. It should support by suppression, there is no shaping in the pattern and not even elastic at the bottom edge. It looks very pretty but I am slightly worried my bust may be too large for it. I want to try and make my own this weekend. 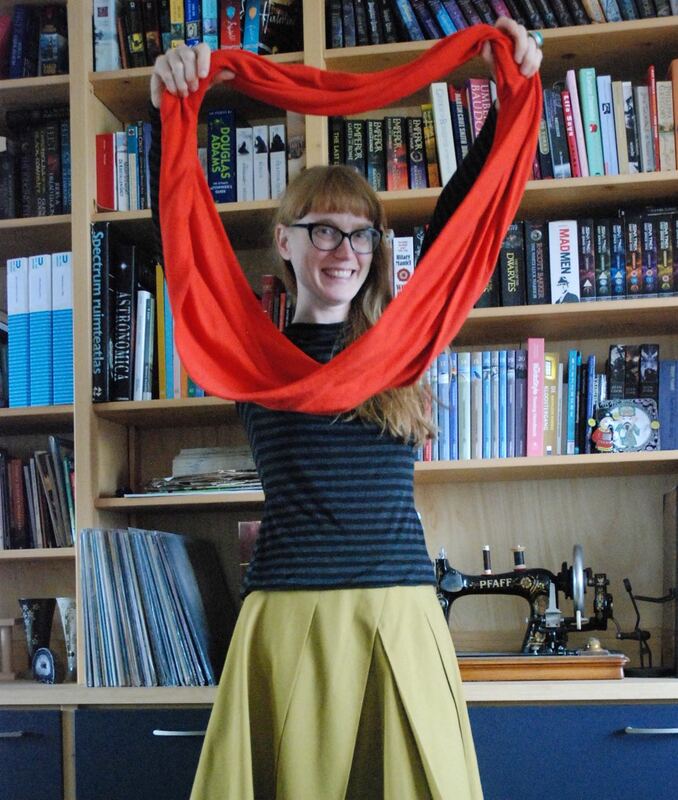 And then, one of the ladies on We Sew Retro Sew & Tell posted her version of the Va-Voom Bullet Bra. I had seen other versions before, had visited the website when the sew-along was in progress but it didn't seem like something for me at the time. Sizes for a C and DD cup... but the lady in the Facebook group also mentioned having "trimmed" the pattern so maybe I could give it a go. I have just stitched up a very rough muslin and made some size alterations. I transferred the changes to the pattern and plan on making a more detailed toile before trying a real one. I'm not sure it will work. It's a very pointy shape. 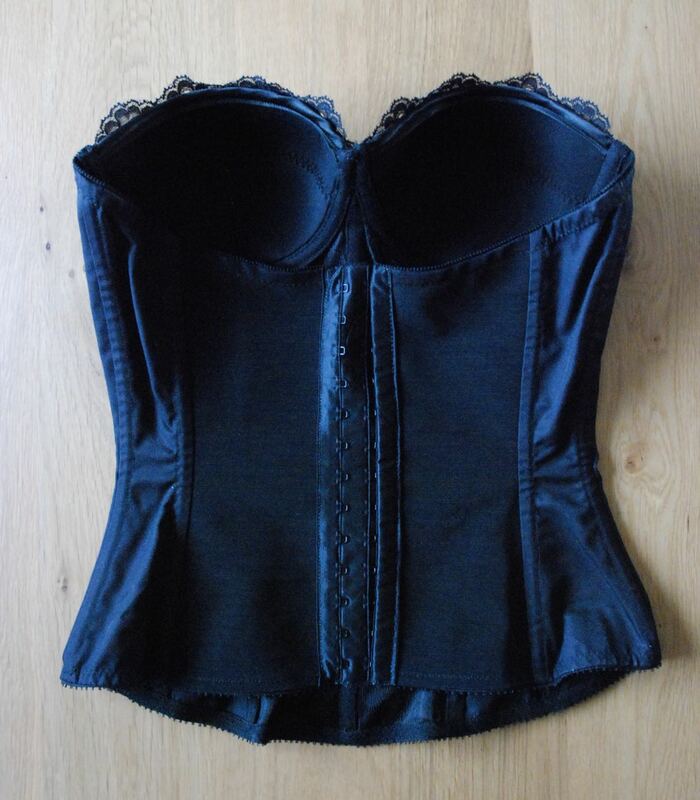 My lingerie corset is finished! I had planned to make the main body from non-stretch lingerie net covered with lace but ended up going for sturdy woven fabric for most pieces. My toile showed me that the weak the cheap net material from my stash was a bit weak for this kind of garment. The black stuff is a bit stronger than the skintone variety, but still. That, and I didn't have enough lace to cover all the panels anyway. So, for all but the center front and back panels, I used the fabric I bought for a corset for an friend and also used for the strong inner layer of my party dress. The center front panel is made from net fabric covered with lace and the back panels are from powernet. The cups are made from cut-and-sew foam and covered with the same lace. There are underwires under those cups and spiral steel bones in channels at all those vertical seams. I thought about applying waist tape but didn't know how to make that work with the stretchy back panel. Unfortunately, it is difficult to photograph. I made some alterations based on the toile: I made the whole thing a bit tighter and put some more waist definition in the front panels. While I was sewing, I grew afraid that between the change in fabric and the alterations, I had made the whole thing too tight. But of course, you can never really try on a lingerie item until it is completely finished. And then, to my relief, it fit. When I worked in bridal stores, I used to help brides-to-be into their lingerie corsets (like the RTW one I showed you in the previous post). Some ladies insisted on a small size and I remember pulling with all my strenght just to get the first hook and eye together. This thing is snug but I can still hook it up behind my back myself, without anything near that kind of effort. It sort of looks like a proper corset when seen straight from the front or back but that is just the combination of my natural waist-to-hip ratio and a lingerie corset tailored to fit me. It does what a lingerie corset is supposed to do: It sqeezes in just a little but mostly streamlines and supports. I'm going to see what it feels like to wear for a longer period of time and if I'm happy with it, I may make another version. I'm thinking skin-tone lingerie net (the real, high-quality stuff. I think I have found a webshop which sells it) covered with black lace with a large-scale flower motif. I won't be very practical in everyday life but I think I will try and make myself at least one dress to fit over this thing.